I recently returned from an exciting conference in Boston called Neurosciences and Music, and well, you can see why it might be relevant to my interests. The top minds in the world met at Harvard Medical School to talk about their most recent findings on music and the brain. 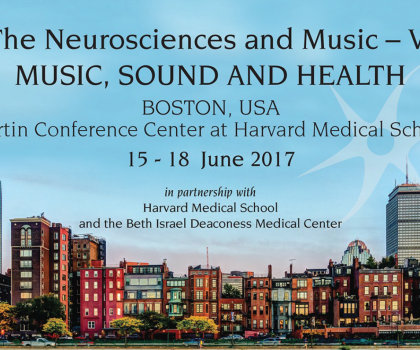 This conference happens only once every three years, and is on the cutting edge of music and neuroscience research. So for those who might be interested in what’s new in music neuroscience, but don’t have time to read it all for themselves, I thought I’d try to distill some of the more interesting findings there into some bite-sized chunks. Research into music and movement was a prevalent topic at the Conference. The following is recap of a few key presentations. Peter Vuust (Aarhus University) investigated the feeling of “groove” by manipulating the syncopation of various rhythms. People judged rhythms with moderate amounts of syncopation the most pleasurable, and were most likely to move to them as well, compared with ones that were too simple or too complex. Giacomo Novembre (UCL) presented an interesting study on using transcranial alternating current stimulation to entrain “hyper-brain networks” through synchronous neural oscillations. His group found that in-phase 20 Hz dual-brain stimulation (i.e. electrical pulses to each partner’s brain at the same time, 20 times a second) helped pairs of people to synchronize in a finger tapping task, even from the very first tap. However, frequencies other than 20 Hz did not show this effect. Caroline Palmer (McGill, and my former Ph.D. advisor) presented data from her current student Anna Zamm on the neural correlates of how pianists synchronize with each other while playing duets. They used wireless EEG to measure the patterns of neural responses in randomly paired pianists repeating Frère Jacques 20 times in a row, and discussed how the frequency characteristics of the neural response was associated with different aspects of their ability to coordinate. Floris van Vugt (McGill) described an experiment designed to test the ways in which people learn connections between actions and sounds, and how we correct movement errors in performance. His study used a set-up where participants would point to a position in space, which would create a sound based on the location they pointed to (similar in concept to a Theremin). His results described the mental maps people used to learn this new “instrument”, and how they used their knowledge to correct errors. Shinichi Furuya (Sophia University) looked at how musicians use auditory and proprioceptive (sense of where your body is without needing to look) feedback to control their movements. His data showed that musicians adapted sooner than non-musicians to delayed auditory feedback. In addition, by reweighting the keys of a piano, he showed that most pianists could adapt to the change in the feel of the instrument. However, those with focal dystonia (a neuro-muscular disorder that can affect musicians) were not able to adapt to the re-weighting. This may be associated with hyperactivation of the cerebellum. Nicolo Bernardi (McGill) explored the ways that dance can enhance the emotional response to music. He used motion capture to record participants’ dancing to music rated as “groovy” or not, and followed this up by asking participants to rate their enjoyment of the music while they were still, dancing to the music on their own, or copying a dance. His results showed that participants’ enjoyment was highest when they were dancing to the music on their own, and that people rated dancing the highest when there was the most movement of the elbow. His results also showed a lot of good (and bad) dancers! In the next installment I will share research about music with infants and children.